A video of a car being backed at speed towards oncoming traffic in Los Angeles went viral, with the city police now looking for the daredevil male driver, who was filmed speeding in reverse by a stunned witness. 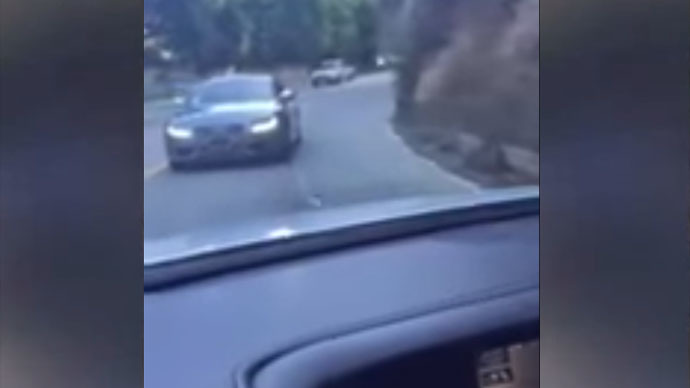 The driver of the Audi car maneuvered through busy traffic in LA's Laurel Canyon neighborhood in the Hollywood Hills. The witness who filmed the car followed it from Mulholland Drive toward Sunset Boulevard. At some point, the Audi can be seen overtaking another vehicle - still driving in reverse. Commenting on the unusual and unlawful practice on a winding busy street, the man with the cellphone can be heard saying "Amazing," "He's real good," and "Only in LA!" "It definitely was a shocker for me," Kevin Zanazanian who filmed the video told local KCAL/KCBS, adding that he saw two people in the car, a man behind the wheel and a woman in the passenger seat. The vehicle only had dealer plates. LA cops look for 'reverse' driver: Imagine driving down a busy street and a car seems to be heading right at you --- in the same lane. Police weren’t in the least impressed with the incident, calling the Audi driver's antics "some of the most reckless driving investigators have ever seen," as cited by the local channel. The LAPD is now looking for the unidentified reverse daredevil, who could face numerous charges.